Ideal for companies that need a large capacity, heavy-duty multi-head resaw, the HR700’s modular design makes it easy to expand from one to a maximum of six heads as production demands change. In its maximum six head configuration, the HR700 converts large cants into six boards and one slab in a single pass. A separate control stand holds all controls for the resaw. Centralized blade tensioning for each two-head base makes the blade change process more efficient. Standard, head height is positioned with a manual screw. 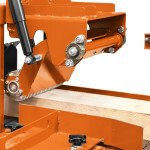 Optional Setworks with electric up/down are available, which increase speed and precision when adjusting the heads to produce different sized lumber. 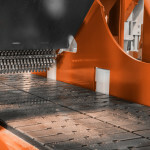 The twin-track steel belt conveyor provides a solid and durable surface that fully supports the entire cant width. 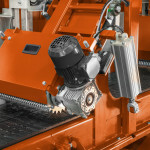 Heavy, powered rollers stabilize and feed the cants through the heads during sawing. This makes it easier to process short cants or material with internal tension. 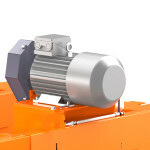 A pneumatic sensor automatically raises the rollers to accommodate incoming cants. The roller speed is synchronized with the conveyor belt speed, providing more precise cutting, especially for thin boards. The base HR700 module includes two heads as standard. To extend the resaw, add another two-head module and install a longer conveyor belt. The modular design gives businesses the option to scale up their resaw capability as their demands change. Extra power for increased production. The durable hydraulic driven steel chain provides longer life and less downtime than rubber belts. For shorter cants less than 4' long. Max cut height changes to 10". Heavy, hydraulically powered rollers securely feed a variety of wood types. Each module has centralized blade tension and lubrication. 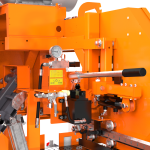 Increase operator productivity with the optional setworks and auto up/down. The base HR700 module includes two heads as a standard. 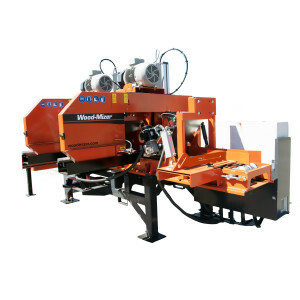 To extend the resaw, add another two-head module and install a longer conveyor belt. 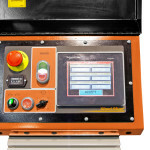 The modular design gives businesses the option to scale up their resaw capability as their demands change.